How to reset Honda CR-V Stereo Code | Anyone Can Do It! Almost all Honda radios have their anti-theft system that, if the battery is disconnected, will ask the owner or user to enter a five digit code so that the stereo or Cd player will work again. When you purchase a car, the dealer of the company should give you the Honda CRV Radio Code. It may be written in front of your user’s manual. But if you lost your stereo code, you need to contact the dealer of the car who sold it to you and ask them to look the auto-radio code for you. If the power of the battery to the radio was lost altogether, all the presets of your station will be deleted. So you have to find your preferred stations in the audio system and reprogram it again. When the battery of your car died, it will definitely lock the radio up. This will prevent the thefts in using your stereo or GPS system. Resetting a locked Honda crv stereo is fairly simple, just keep reading I will show you exactly how to unlock your CR-V Honda stereo code for free. Are You Sure That Your Honda Car Stereo Requires A Code? If it does, once power has been restored to your vehicle, you will see a flashing message on the screen indicating that you must enter a special code to disable the anti-theft system. The message may be the word "Code". Do You Have The Radio Code? Look for the document of the car. When you bought your Honda, you should have received a small document about the size of a credit card along with the owner's manual. You will find the code printed on that ID card, so all you have to do is enter the PIN code to reset your Honda CR-V. The five or six digit secret number can also be written on the radio itself (so you need to remove the unit from the dashboard to see). Also, you have to check inside of your Glovebox. The code can be listed on a small white sticker inside it (will be labeled “Anti-Theft Radio Code”). If you find it, just enter it using the preset buttons. You can refer to the code entry section for more details. But if you lost you code and can’t find it don’t worry. You can still recover it. But first you’ll need your radio serial number to calculate the code. 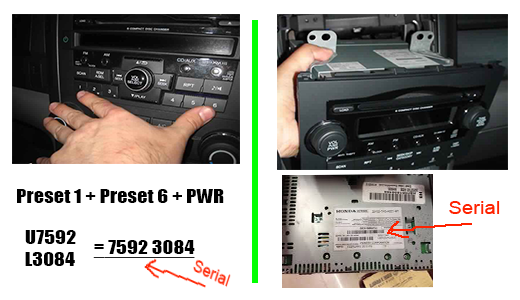 How To Find The Honda CR-V Radio Serial Number? The first way is that you pull your car radio and than look up the serial number on the side or the rear, its probably on a sticker somewhere on it. The second is much easier, you put your key in the ignition and than, turn it on to the accessory position. Next you hold down preset key number 1 and key number 6 and than press the power button once, and a second time. You will see a digital serial on the display, for example U7592 L3084. Ignore this U and L, then note all 8 digits on a piece of paper, we will need it in the next step. The next thing you want to do after getting your serial, is basically just call your local dealership and explain the situation try to sound as legitimate as you can so they don't think you stole the radio or something. But if you don’t succeed at first, try different dealerships in different cities, different states until it works. Don’t let them bring you the car in and than charge you a 100$ for one hour labor fee or whatever to give you the code, ok!! Wait , this is not all, I have an other trick for you to recover your Honda CR-V code! In fact you can get it online. yes, just go to this web page and fill the online form. They will send you the code by mail. Take a look at this video tutorial, I will show you exactly how to do it. Now I Have The CR-V Code, How Can I Enter It To The Radio? Finally, after all these steps you have your CRV stereo code. All you have to do now is to enter it to the car radio unit. You can discover this in the Honda code entry tutorial, where I explain by video what you need to do, step by step. Congratulations, today you learned how to reset your Honda CR-V stereo code. Don’t forget to note it in a safe place so you can refer to it any time you need it, do it NOW!! Also it is a good idea to bookmark this page to easily find it in case you will need help with Honda CRV car stereo code recovery in the future. Normally this Tutorial goes with CR-V 2009, 2011, 2012 and almost any other model. 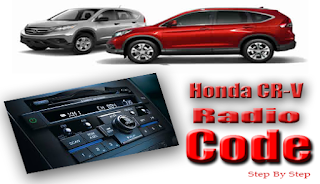 If you have any problems or Honda CRV radio code error, feel free to post comments or email me and I will be more then happy to help. Don’t forget to like, share and sign up for the newsletter to stay updated with the latest Honda automotive technology. Can you plz send me the radio code. Please send me the radio code. I haven't had a radio since I bought the car about 3 months ago. I just luckily found YOU. Thanks so much. Hi, Please help me. I need code to my radio. Can you please send me the radio code? enter your vin number and serial number. you get your code instantly. Hi there, it's become very cold and my battery go down, and my radio gets lock! Please, could you help me! Hi! My Honda CR-V battery go down. I can't find my audio code and website radio-navicode.honda.com don't work. Could you help me? Please. Hi, I could not find my 2011 CRV code. Can you help me? Hi i really hope you can help me, ive got an honda hrv and had to recharge battery and now its asking for a code which i dont have. Hi! My Honda Accord CU2 battery go down. I can't find my RADIO code and website radio-navicode.honda.com don't worK with my VIN (car in german) Could you help me? Please. Hi, Left the the lights on killed the battery. Need the code please. Same problem, I need the code..
Hi, I too have no code for my radio! can you help me with the Radio Code? This is a really DUMB feature by Honda. Thieves everywhere are looking for Honda factory head units????????????? Can you pllz send me the radio code. Hi can i have my code auto. This is some reference, VIN:SHSRD87602U001613… S/N: 30003021. I cannot find my radio code my VIN is JHLRD78493C810857. Serial # U230 8 L057 7. Please email gulliesgirl66@yahoo.com please help me. My code that came up is: 15539620. Please email ana.meza@kettal.es - Please Help & Thanks! Hi I have replaced the battery on my Honda Crv 2003 and now my radio is not working. Hi! I need you help me. I lost my Honda CRV (made in Mexico) Radio Code. Hi! I have replaced the battery my Honda CRV 2011 (made in Mexico) and now, the radio does not working. I lost mi code.....please help me. lost mi code.....please help me. It does not accept my zip code because is canadian. I meant I could not do it. Sorry. I have Honda with radio serial number M97A132412 which need a code. Can you please help me, couldn't get the code for my radio/ sat nav. Hi can you help me, my radio says its "error e" i dont what to do. I have a 2004 Honda CR-V. After my battery went flat now my radio is asking the code. Can you please help me? If you can help please. Thanks very much. I have a 2011 Honda CRV ,can u help me? I have a Honda CRV 2009. My battery was dead and I had to charge it and now it requesting for the code. Can you please help me. Could you pls pls send me my radio code so I can listen to my stereo again?? Thank you!! Hello. I had to finally replace the factory battery in my 2003 Honda CR-V. Please send me the radio code. Please send me the radio code. I haven't had a radio since I bought the car about 2 months ago. Help needed please! I replaced my car battery and now cannot listen to the radio. I need my radio code for my 2004 Honda CRV please. Hi, I can't use my radio anymore please cab you please send me the unlock code of my Honda CRV? Hello, I can't use my radio anymore please cab you please send me the unlock code of my Honda CRV? 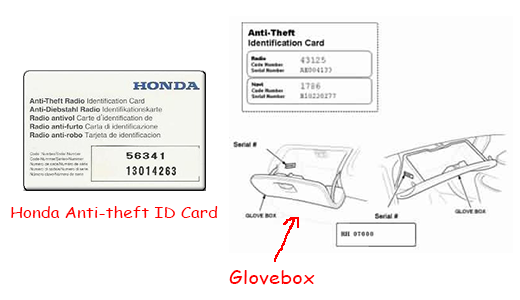 Do you know how can I get the serial code in Honda CRV 2015 Touring or EX-L? Hola soy Ramón de chile tengo problemas con mi código es una crv 2008. Gracias de antemano. Saludos a todos. Hello! This our first time posted it my husband got a 2002 honda CR-V LX Vin:JHLRD78402C059467 don't know the S/N it been locked for 2 days now and it was working 2 weeks ago please help my husband is deaf I am trying to help him as I can. Our email is lr4225837@gmail.com pls soon as possible!! I found the radio code, but keep getting an error message when I try to enter it. Any advice? Hello, Please help me. I need code to my radio. I lost my code.....please help me. Can you please send me the radio code. I need a help whit my Honda Crv 2009 radio. If I want to retrieve the password for my Honda CRV 2014. Can I avoid physically taking out the audio-video system with a method similar to pressing pre set buttons F1, F4 and power button. In this case, I have touch screen so no pre set buttons. I lost my code. Can you help me? Can you please help me get my code? I live in Canada and can't get it from https://radio-navicode.honda.com/ because I don't have a zip code. I replaced the battery, now I need code to my radio. Help me plz. Hello, I need a help whit the CODE of my Honda Crv 2005 radio-replaced battery. 2010 CRV start car in the morning only bass on radio....need to restart and everything seems OK...any advice?